Maywa Denki is organized in 1993 as an art unit of two members (brothers), Masamichi (elder brother) and Novmichi (younger brother) Tosa. They started their career as an exclusive art unit belonging to Sony Music Entertainment, and later in 1998 transferred its management agency from SME to Yoshimoto Kogyo Co., Ltd.
Maywa Denki is an art unit produced by Novmichi Tosa. It was named after the company that his father used to run by gone days. The costume is designed as a typical working uniform of Japanese electric stores, symbolizing small/medium-sized enterprises that had once supported Japan’s economy during its high-growth period. Its unique style is indicated by a term he uses: for example, each piece of Maywa Denki’s work is called “a product” and a live performance or exhibition is held as “a product demonstration.” The products produced so far include “NAKI Series,” fish-motif nonsense machines, “Tsukuba Series,” original musical instruments. And as an activity besides of Maywa Denki, Novmichi announces “Edelweiss Series,” flower-motif object art. Although Maywa Denki is known and appreciated as an artist, its promotion strategies are full of variety: exhibition, live stages, performances, producing music, videos, writing, merchandising toys, stationery, and electric devices. As Novmichi is still looking for a new scheme for a different approach to the public, Maywa Denki now in earnest begins to extend its activities to overseas, holding exhibition in over the world. 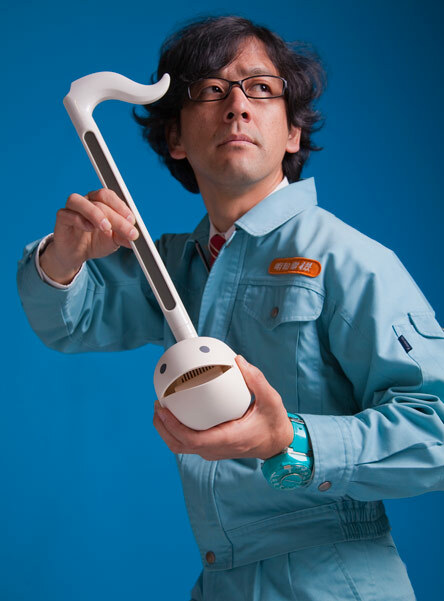 “Otamatone” which is produced as a piece in “Voice Mechanics series”, has many fans all over the world after its release.Won a grand prize in the high target toy category at the Japan Toy award 2010. Otamatone DX is also releaed in the spring of 2012. Formally nominated as a cultural envoy for the Agency for Cultural Affairs of Japan in 2013. 2013 was the year of Maywa Denki’s 20th anniversary. It held the memorial concert at Akasaka Blitz and the retrospective exhibition at the 21st Century Museum of Contemporary Art, Kanazawa. 2015, “Awarded at the World OMOSIROI Award” 1st for an OMOSIROI Award. September 2003, Ars Electronica “Cyberarts 2003” at the O.K Centrum für Gegenwartskunst, Linz, Austria (9.06-9.21). November 2003, “HOMMES ET ROBOTS” at La maison de la culture du Japon, Paris, France (10.28-1.31). July-December 2004″NONSENSE MACHINES” at Hiroshima City Museum of Contemporary Art,Hiroshima (7.31-10.11) and at NTT InterCommunication Center, Tokyo (11.03-12.26). December-October 2005, “Maywa Denki : Exhibit Nonsense Machines” at the JSMA , Oregon, America (10.21-11.20). October 2006-January 2007, “Nonsense Machines: NAKI” at Agnes b.’s LIBRARIE GALERIE, H.K.(9.23-1.13). January-April 2011：Exhibition “Agnes b.’s Musique Plastique” at Pari France (1.28-4.02). June -July 2011: : Exhibition “TRANSFORMER” at Bethune　France (6.14-7.31). September2011 : Exhibition “Ars Erectronica Campas 2011: Seriously Playful / Playfully Serious – University of Tsukuba” at Linz, Austria (9.01-9.06).